Darjeeling, world famous for its teas, is nestled in a setting of Kanchenjunga and Mount Everest, Tibetan Monasteries, Himalayan Tribal Life, Pine Trees etc. Which make her qualify as the queen of the hill stations. Darjeeling owes its grandeur to its natural beauty, its clean fresh mountain air and above all, the smiling resilient people for whom it is a home. Known for its natural splendor, Darjeelings best gift to its visitors is the dawn of a new day. The rains which start by May end are heavy downpours making living conditions cold and dreary. In winter there is a drastic fall in temperature from the summers 15 to 25 degrees centigrade to 2 to 10 degrees in winter. 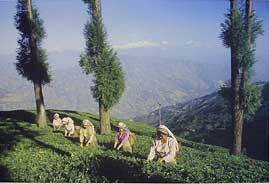 The best time to visit Darjeeling is from March-May or September-November. No visit to Darjeeling is complete without a visit to Ghoom which is 6 km away from the main town. The hillock is dominated by the famous Yiga Choeling Monastery which has 15 images of the Maitreya Buddha. The monastery contains many ancient palm leaf and paper manuscripts in Tibetan script. The Museum of Natural History is where one can see a fine collection of Himalayan animals, reptiles, birds and insects. If flora is what one enjoys, then Llyod Botanic Garden is the place of interest. It has a marvelous collection of alpine flora and orchids. Padmaja Naidu Himalayan Zoological Park is the only center in India for the breeding of the rare snow leopard. The Ussurian tigers and the Himalayan black bear are also among its attractions. Neighboring the zoo is the Himalayan Mountaineering Institute established in 1954 by the then Prime Minister, Jawaharlal Nehru, in the wake of the conquest of Everest. Tenzing Norgay was its first Director and Advisor till his demise. A kilometer from the zoo is the Darjeeling-Rangit Valley ropeway. Considered the longest in Asia, it is a thrilling ride with splendid views. If one is looking for souvenirs, then the Tibetan Refugee Self Help Center. It produces excellent Tibetan crafts like carpets, wood and leather work. Established in 1959 after the Dalai Lama and his followers fled Tibet, it is a haven for ethnic Tibetan art. Across the river, Teesta lies lush Kalimpong. The road weaves lazily up a steep incline to suddenly open up to an unexpected panorama. Its rolling meadows are as yet untouched by tourism. For a birds eye view of the picturesque place, one has to go to Durpin Dara, an observatory point atop a hill from where one can get an awe-inspiring view of the mighty Himalayan ranges. Numerous monasteries dot the area among which the Pedong monastery and Thongsha Gompa are the oldest. Another monastery of interest is the Tharpa Choling Monastery constructed in 1937 by the Yellow Hat sect which is situated at Tirpai Hill at a distance of two kilometers from town. About 4 km from town towards Teesta is located Kalimpongs famous Swiss Welfare Dairy. Cheese, butter and other dairy products of this center are in great demand and the quality is comparable to the finest that is imported. The visit to Kalimpong wont be complete unless one spends several hours at the two bazaars. One on the main road, the other near 10th mile. It is a unique experience to see villagers turning up in their local costume at the bazaar on weekly market days to sell their farm products. Set in idyllic surroundings, Mirik is the place for those seeking peace and tranquility. At an altitude of 1967 meters, the climate is cool and temperate. The Sumendu Lake at the bottom of Mirik Spur is the most dominating feature reflecting the magnificence of the eastern Himalayas. Riding on the colorful boats or crossing the lake over an artistic bridge, leads one to a charming path through forests on the other side. Fishing is a popular past time here. Mirik is also almost completely surrounded by some of the best tea gardens of the region. It is also the largest producer of oranges in West Bengal. The orchards are on a spur two kilometers from Mirik. Tourist cottage constructed from locally available material have been constructed in the dense forest and provide all modern facilities for a comfortable sojourn. Darjeelings traditional promenade, the Chow Rasta, bustles with the increasing tourist influx and is the throbbing heart of Darjeeling with restaurants and shops lining the way. It has famous eating joints, known especially for milk shakes, pastries and scrumptious patties. At certain studios one can buy the most fascinating photographs of the snow capped mountains that surround Darjeeling, and portraits of locals in traditional attire are souvenirs worth buying. Walking down a countless flight of steps, past colorful vendors, one will come to the lower bazaar. It is a more traditional and lively bazaar filled with a jostling melee of people.